Ride The Hill City Trail On June 7th -- Join us on this great club ride! Meet at Sunny’s gas station at Hwy’s 169 and 200 in Hill City at 9:30 a.m. (about an hour’s drive from Hackensack). There is a large lot for parking right there. Watch for the Woodtick Wheelers trailer. Bring a picnic lunch. We’ll ride the awesome Hill City Trail to the Soo Line Trail and a portion on the Blind Lake Trail, with stops at picnic areas with restrooms along the way. Bring a dust mask or bandana in case it’s dusty. Club gear will be available for sale. See attached pdfs of maps. Also, thanks to ATVAM, June 7-8 is “No Registration Weekend.” That means that, if your ATV is registered only for private or agricultural use, you can use your ATV on this club ride or any of the state’s public ATV trails without having to pay the trail registration fee. Dirt Bike School Is June 21st -- Always wanted to learn how to ride a dirt bike? Have teens who already ride but can use some technical instruction? Or kids 6 and up who would like to learn how to safely ride our club’s new Honda 50? Two certified coaches with the Motorcycle Safety Foundation will put on a Dirt Bike School for our club on June 21st. It’s a 6-hour class, to be held in the Park Rapids area or in the Twin Cities depending on where those attending live. The cost is normally over $100, but the MSF-certified instructors, Tom and Karen Umphress, are doing it for our club for just $35 per rider. They need to know names and ages at this time to organize the class. If you are interested in taking the class or having your kids take it, contact Dave Halsey for more details and to register, at dvhalsey@aol.com. MNDOT Postpones New Longville Bridge to 2015 -- In order for the City of Longville to put an ordinance in place allowing Class I ATVs on city streets, it needs to get a Limited Use Permit from MNDOT to allow their use on State 84. MNDOT will only give the city the LUP after it replaces the bridge in town, earlier scheduled for this year. MNDOT has now postponed that construction until 2015. Class II ATVs are allowed in Longville. 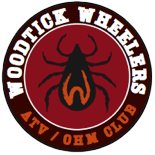 Woodtick Wheelers in new DNR OHV Trail Atlas. Last summer, several club members volunteered as riders for a 2-day DNR photo shoot. Some of those photos are now on the DNR ATV web site and publications, including the new 72-page OHV Trail Atlas. 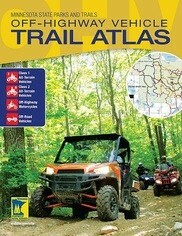 It features maps, descriptions, parking and other information for 51 state and GIA trails for ATVs, OHMs and ORVs. To get your free copy of the atlas call the DNR at 651-296-6157, 8:00-4:30, Monday-Friday. Individual trail maps are also available online atwww.mndnr.gov/ohv. Questions: email Dave Halsey (dvhalsey@aol.com) or call him at 612-723-1987. Get your free copy of the new DNR Trails Atlas!